I planned to start and finish this project back before the holidays, but ended up waiting until Tom was done with a big project at work. He still had vacation time left over from 2011 and has been enjoying some time off, so we tackled the upstairs bath re-do last week. First of all, I've done lots of thrifty room makeovers since we've moved in. This bathroom, though, was beyond a couple coats of paint and new window treatments for a makeover. 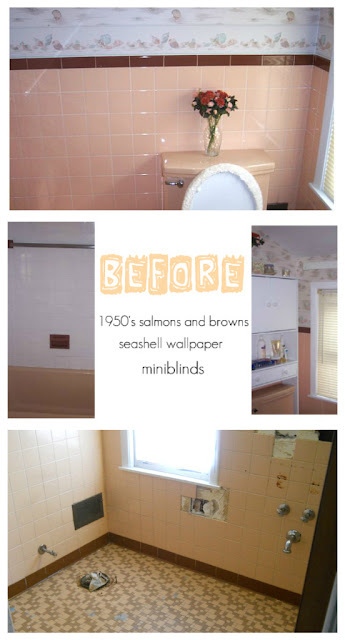 This was a traditional 50's salmon/pink/peach bathroom. In fact, I called it the Salmon Explosion. The walls were tiled more than half way up with this tile. The floor had a tile with salmon and brown. It was just awful. You can see it below--note, the bottom picture was taken after Tom removed the salmon toilet and sink. 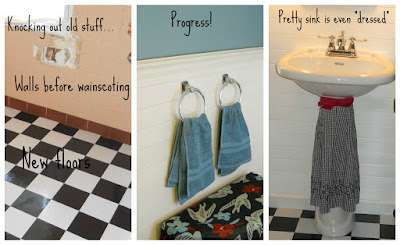 For my bath project, I wanted to take it to a more modern look, but still have vintage charm and a quaint, cottage vibe. #1 -- I primed and painted the walls. The color I chose is called Secluded Guestroom. It's a gorgeous blue by Walmart ColorPlace, which we had color matched in Behr Semigloss at Home Depot. #2 -- We put down a new black and white checked floor. LOVE! #3--We sanded down the tile and then put wainscoting (horizontally) and adhered it to the tile covered portion of the wall. Then we applied the chair rail and baseboards. I painted these white. I originally planned to do traditional wainscoting which has vertical boards. I saw a picture online with horizontal plans and decided to hang our this way as well. #4 -- Tom put in the new toilet and pedestal sink. The new faucet went in too. #5 -- Tom drilled holes for the new toilet paper holder and towel rings. I hung them up--they were an awesome deal on Amazon.com--chrome Kohler for a great buy! The color inspiration? Actually, it was a scarf I bought from my friend Tanvi at Peppermint. When I saw it hanging in my closet, I knew I wanted to add it to tie in some blue and red. I need to take more pictures, but I also have a little red bucket style metal trash can and a couple other red touches added to the blue and white. I'm actually using the scarf right now on the little table in there. I found Ty Pennington shower curtain hooks on the 75% clearance at Sears. They cost me $3.74. The shower curtain was less than $10 on clearance, too! I bought these back in November at the Irondequoit location. It took us from Monday through Wednesday working almost all day last week while the kiddos were at school, but it was so worth it. 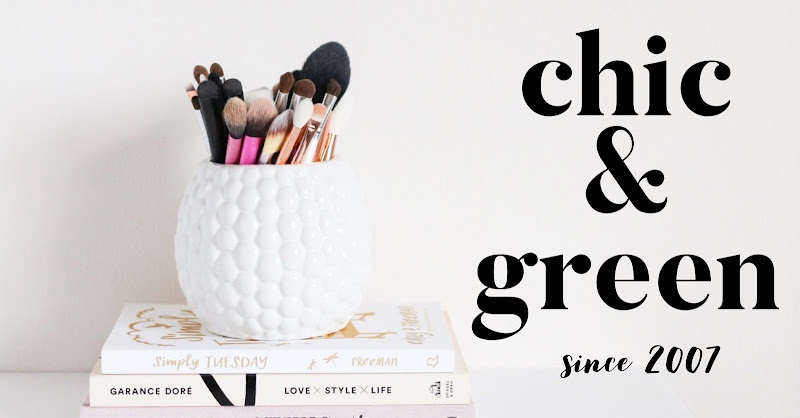 Did I mention that our DIY re-do was less than $500 for everything? Not too shabby! If you have a project that isn't this thrifty, there are options. You can save money for home improvement projects with a mortgage refinance. Next project--tackled! Today, Tom cleared out the downstairs coat closet. It's now a little home office for moi. I'll take pictures this week for you to see!